You know it's bad when a left-wing progressive Jew enthusiastically quotes Ze'ev Jabotinsky. I know Jabotinsky’s politics were dangerous, and it’s going to make my friends’ heads spin to see me quote him. But so much of Jabotinsky’s shock value comes from his candor about how Israel would affect the Arabs of Palestine. He recognized that achieving Jewish aspirations meant carrying out an occupation — something contemporary apologists for the settlements think they can hide by not using the O-word.Jabotinsky also adamantly opposed expelling Arabs from Israel. Yes, he loved a wall, but it was a metaphorical wall, not a physical one like the wall of Trump’s speeches. Jabotinsky thought Jews should have the will and means to defend Jewish communities against attack. As he said, “Better to have a gun and not need it, than to not have a gun and need it.”We ought to listen carefully to Jabotinsky’s words. It’s no joke to say we need to build an iron wall today, to stop even the first steps to fascism in the U.S...."
David teaches text and music, Jewish thought and spirituality, in their own right and in relation to ecology and the environment and has ordination from the Jewish Theological Seminary and from Rabbi Zalman Schachter-Shalomi. That quote about having a gun and needing or not to use it comes from Mordechai Anelewicz, who before joining HaShomer HaTzair in Warsaw was in Betar. And that quotation about "occupation" and "an immensely superior force" does not appear in the Jewish War Front. Here, check. strongly condemned Israel for allowing settlers [are all Jews "settlers"?] to enter the courtyards of Al Aqsa Mosque-Haram Al Sharif in occupied East Jerusalem, saying it violates the sanctity of the mosque, and harms the feelings [what about Jewish feelings harmed by Muslim behavior and attitude?] of Muslims worldwide. ...the Jordanian Government, holds Israel, as an occupying power, responsible for any violations against Al Aqsa Mosque-Haram Al Sharif. Momani, who is also the government spokesperson, said any attempt by Israelis to storm or enter the Haram Al Sharif compound, is illegal [like living in the Land of Israel?] and an aggressive act against Islamic holy places and the feelings of Muslims. The minister also reaffirmed Jordan's stance on maintaining the status quo at Al Aqsa Mosque/Haram Al Sharif. ...Principle four: Provide an agreed resolution for Jerusalem as the internationally recognized capital of the two states, and protect and assure freedom of access to the holy sites consistent with the established status quo. This is an invidious return to November 29, 1947 and to allow the Arabs, once again, to point to a basis of diplomacy that will enable them to wrench all of Jerusalem from Israel's sovereignty and to submit Judaism's religiously historical ties in the city and to the city and its sacred places to an equal footing to other religions. It's a throwback to the 1928-1929 dispute in essence. I hope Israel's diplomats and world Jewish leadership pay careful attention to this sleight-of-words. On the idea of a 'holy zone, see here. Some have noted to me that this is actually "old news". a. some of us who know that history do not know that people under 30 simply do not. it's new news to them. b. Jerusalem is a great wedge instrument on our behalf. speaking of "division", any "division", more (all the "East" from the "West") or less (only the Holy Basin) works to our advantage. c. the point is that actually SC 2334 + Kerry's speech was a double division. 1st - east/west and 2nd - Holy Basin which becomes internationalized. once we can highlight subterfuge and sneak diplomacy, that is, SC saying one thing and US policy statement taking that and furthering the lessening of Israel's connection to, not to speak of administration of, Jerusalem gives us a leverage. In fact, some 60,000 Jewish American immigrants have settled in the occupied territories since 1967. Many dwell as contented suburbanites in settlements in wealthy communities like Efrat (just over 11 kilometers – or 7 miles – from Jerusalem) whose moniker is "Occupied Scarsdale", living the yuppie dream over the Green Line. Apart from their roles as settler leaders and cadres – and occasionally, a tiny minority who have committed heinous acts of settler terrorism – their priority contribution to the settler movement has been to revolutionize its public relations and global reach. Jewish American settlers have served as English-language spokespeople and “public diplomats” for the settler enterprise, spearheaded lobbying and fundraising campaigns in the United States and Israel, and single-handedly transformed scripture into a soundbite to justify and normalize the settler movement’s agenda to the international community. Most recently, American-Israeli settlers, closely linked to Israel's political right wing, led by attorney Marc Zell of the GOP in Israel have even mobilized an expat voting bloc in the West Bank after Trump supporters opened a campaign office in the settlement of Karnei Shomron this fall. 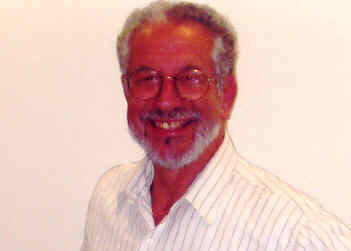 David Friedman helped coordinate their efforts and remains in close communication with his friends and allies within the settlement enterprise. The head of the Supreme Islamic Council in Jerusalem, Sheikh Ikrima Sabri, denounced on Thursday, a Jewish bride's celebration inside the al-Aqsa mosque under the protection of the occupying forces. In an interview with the site "Daily 48" Sheikh Sabri said: "This alleged action is to exceed what is observed in the visits, and this confirms that the Jews who violate the sanctity of Al-Aqsa Mosque." He added: "What we observe in these days is that the Jewish intruders slander the Al-Aqsa Mosque daily." He expressed his strong condemnation of the storming by the Jewish bride and her wedding blessers into the Al-Aqsa Mosque. Stressing that the Al-Aqsa is for Muslims alone and it has , no relation to the Jews. By the way, I know the parents, seen at left, to the bride's right. I have now learned that the black shawl was forced upon the bride, who had her own veil, so as to lessen the fashion impression and have her present an Islamist fashion look but that nevertheless, she seems to have been the first kallah to have ascended in her wedding dress. A Stone Bowl Engraved with a Rare Hebrew Inscription – “Hyrcanus” – Dating to the Hasmonean Period was Discovered In the archaeological excavations of the Israel Antiquities Authority in the Givʽati Parking Lot at the City of David, in the Jerusalem Walls National Park. According to researchers, "This is one of the earliest examples of the appearance of chalk vessels in Jerusalem. In the past, these vessels were widely used mainly by Jews because they ensured ritual purity”. 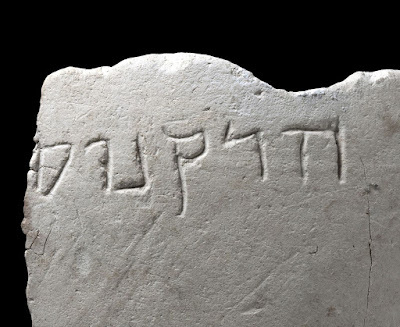 Who was "Hyrcanus" whose name is engraved in Hebrew on a stone bowl from Jerusalem 2,100 years ago? 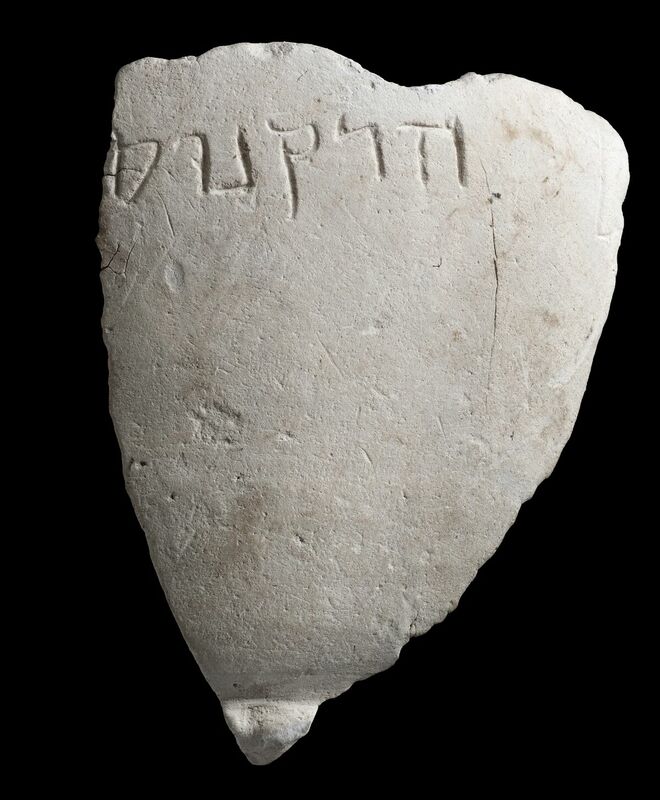 In 2015 a fragment of a bowl fashioned from chalk (a type of limestone) was unearthed in the Israel Antiquities Authority archaeological excavation in the Givʽati parking lot at the City of David, in the Jerusalem Walls National Park. The vessel was published today and immediately aroused the curiosity of researchers. According to Dr. Doron Ben-Ami of the Israel Antiquities Authority and Professor Esther Eshel of Bar-Ilan University, "This is one of the earliest examples of chalk vessels to appear in Jerusalem. These stone vessels were extensively used by Jews because they were considered vessels that cannot become ritually unclean". The bowl was discovered during an archaeological excavation beneath the foundations of a miqwe dating to the Hasmonean period, which was part of a complex of water installations that were used for ritual bathing. Was Hyrcanus, whose name is engraved on the bowl, a high-ranking person, or perhaps simply an ordinary citizen during the Hasmonean period? According to the researchers, it is difficult to ascertain. Since there are few vessels in the archaeological record of this period which are engraved with names, it is not known whether this type of engraving was a routine act or a special tribute. 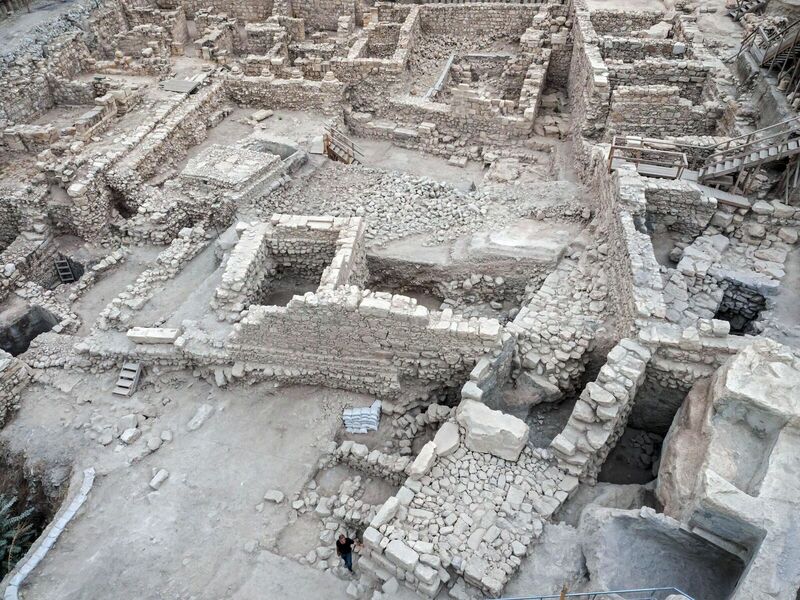 "The name Hyrcanus was fairly common in the Hasmonean period," say Dr. Ben-Ami and Prof. Eshel. “We know of two personages from this period who had this name: John Hyrcanus, who was the grandson of Matityahu the Hasmonean and ruled Judea from 135–104 BCE, and John Hyrcanus II, who was the son of Alexander Jannaeus and Salome Alexandra; however, it is not possible to determine if the bowl belonged specifically to either of them”. Have a happy and historically-significant Jewish narrative-filled Hanukkah (or however you spell it). QUESTION: There’s a great deal of fear and trepidation on the potential ambassador nominee to Israel by the president-elect, because of his position on Jerusalem, his position on settlements, and so on. You have any comment on that? MR KIRBY: Well, I’m not going to comment about individuals that the president-elect is or may be designating for various positions in his administration. Those are his decisions. We respect that. And there’s a process of confirmation that each of these individuals or most of them will have to go through and we respect that process as well, I mean, so the positions that these individuals take are really for the president and his team – president-elect, I’m sorry, and his team to speak to. Nothing has changed about our views here in terms of the tensions in the region and our policies with respect to Israel, so, I mean, all that we’ve said about the viability and the belief in a two-state solution remain, about the – about our concerns over Jerusalem, all that remains. Our deep concern over settlement and settlement activity also remain, but I can’t speak for what policy decisions with respect to the Israeli-Palestinian tensions are going to be taken by the next administration. MR KIRBY: I think we’re going to leave – I think we’re going to leave our counsel and advice to the transition team private and between us and the transition team. 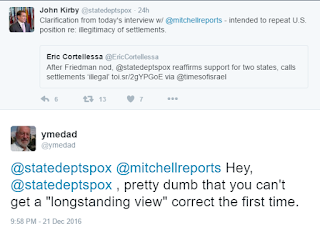 “Our policy is entirely consistent with that longstanding view about settlements, and to the degree also, not just the illegality of them, but that they are not helping us get to a two-state solution, and everybody says that they want to get to a two-state solution,” Kirby said. By the way, Mitchell claims that the 'policy' goes back to "Camp David". Which one Andrea? 2000? 1978? Something is bothering someone who is Koret distinguished fellow and chairman of the core curriculum at Jerusalem’s Shalem College * - Rabbi Dr. Daniel Gordis. In a column, A Dose of Nuance — Wanted: A vision for a Jewish and Israeli society, published on December 15, he starts off by comparing "the tyranny of dress code and punishment for women living under Islamic State" and his example there was a women who "lifted her veil just enough to get a spoon into her mouth when she was having a picnic with her family" and who then was "sentenced...to 21 lashes with a cable that had metal spikes attached to it" with "the proposed law that would govern women’s dress at the Western Wall" noting that "if the law passes, a woman who wears a tallit could be sent to jail". Yes, jail is a bit steep, I agree. But one: the law hasn't passed. And secondly, I don't think it calls for lashes. But what if she simply wears a kippa? What if her sleeves are deemed too short and the haredi community finds that offensive? Will she go to jail? How different will the Western Wall be from areas under Islamic State control? To make a comparison, even partially like that, is really odd. After all, if a Jewish woman appears in a less-covered body, say, short sleeves, on the Temple Mount, she, too, will be removed and maybe even arrested or at least detained. She won't be lashed, though. However, the Waqf guards and other Muslims might stone her. Since that is under Israel's control, I think Gordis could have made that comparison, or at least, in passing, noted the situation. He continues and charges an MK with "racism", echoing Joint List head Ayman Odehwho accused the MK with "blatant racism and cheap populism"
Likud Party MK and coalition chairman David Bitan made reference to Prime Minister Benjamin Netanyahu’s infamous comment last election day that Jews had better hurry to vote because Arabs were going “in droves” to the polls. Bitan, apparently, feels that Netanyahu did not go far enough. “I’d rather the Arabs won’t go to the polls in droves, and won’t come to the polls at all,” he said. What party wants to see its opponents going to the polls? he asked. In other words, Bitan, considering the Joint List an Arab party, which it is, spoke of political opponents and was not uttering racialist claptrap. his obvious lack of understanding of how democratic systems function, is bad enough. although he has taken hits for his Zionism as well. What makes matters worse, however, is that citizens have no way of knowing, at least as of this writing, what their prime minister thinks about Bitan’s views. Netanyahu, the consummate political survivor, has chosen to let Bitan do his dirty work, and has remained silent during this most recent brouhaha. So, too, with the Kotel...the prime minister has chosen to remain silent in the face of the proposed Kotel legislation as well. how many of us know what he believes Israeli society should look like? Does he have a vision for how the Jewish state should be Jewish? Does he have a vision, beyond platitudes, for the place that Israeli Arabs should have in a democratic Israel? The fact that few of us can answer those questions is Netanyahu’s greatest failure...our leadership appears stymied; here, too, we are at the whim of political currents no one seems to have the gumption, or principle, to want to confront. He compares Netanyahu to Ben-Gurion who had "penned thousands of pages, filled with his vision for the society he was seeking to shape" and Menachem Begin, who "left an enormous corpus of writing about the society he thought Israel ought to become." That's a tall order and a high bar Gordis is setting. and was an editor of the volume his brother's letters. How many books did Yitzhak Rabin author? this prime minister is not going to bring about a resolution to Israel’s conflict; our enemies are nowhere near ready for that. Do Arabs in Israel count? Do non-Orthodox Jews have any rights? Do we aspire to be leaders of the freedoms of the Western world? Will we be content to become a Levantine backwater? It would be nice to know what our prime minister thinks about all this, to what he aspires. These questions are important but, I would hazard a guess, those are two different sets of issues. One very internal and one that Gordis links to relations with Diaspora communities which practice a very non-Orthodox life style with different Judaic-content practices. As Gordis informs his readers, Netanyahu apologized that his words were not clear and led to a misunderstanding of his actual intentions. Before my election, I said Arab voters were going to the polls in droves. I was referring to a specific political party but many people were understandably offended. I apologized for how my comment was misunderstood. But today I want to go further. Today I am asking Arab citizens of Israel to take part in our society—in droves. Work in droves, study in droves, thrive in droves,"
Arabs do count and Netanyahu is doing things for them including making sure the law is applied to them equally as to Jews. I am still trying to figure out why Netanyahu has become such a problem for Gordis, other than not being Begin. In a promotional message, Shalem presents itself as "not just a college" but "a vision for the Jewish state", an institution that "create[s] leading citizens for Israel...who seek...the betterment of their country...a small group of students poised to make an outsize impact on their country – for Israelis, and for the Jewish people everywhere." New offer for non-Jewish residents of Judea and Samaria - is there Hebrew in that symbol? 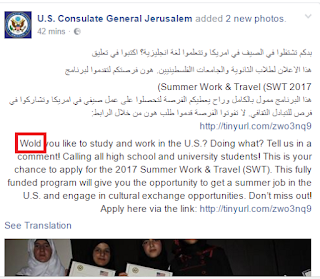 Wold (sic)* you like to study and work in the U.S.? Doing what? Tell us in a comment! Calling all high school and university students! 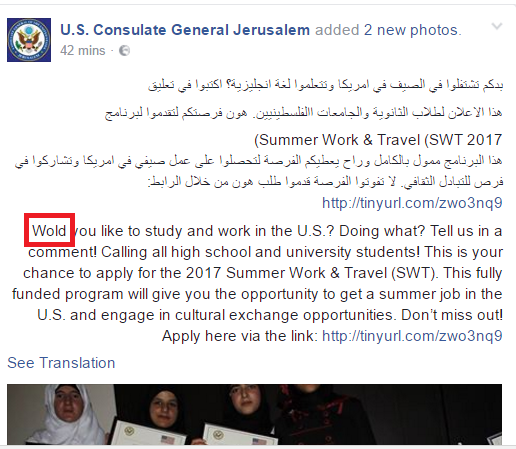 This is your chance to apply for the 2017 Summer Work & Travel (SWT). This fully funded program will give you the opportunity to get a summer job in the U.S. and engage in cultural exchange opportunities. Don’t miss out! Job opportunities: Students who take part in this program are given a summer job and undertake non-skilled work in a seasonal environment. Typical seasonal job types include front desk clerk, sales associate, server, host, ride attendant, and resort worker. Students may work at a U.S. National Park, a mountain or beach resort area, or a popular amusement/theme park in a variety of U.S. states. Candidates must be Palestinian residents of Jerusalem, the West Bank, or Gaza Strip. Maybe, with the new ambassador arriving soon, the Consulate as is should be shut down and relocated to Ramallah if all it is interested in in "Palestine" and "Palestinian residents"? 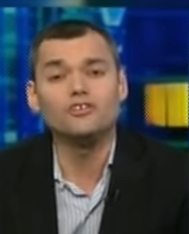 For those following Peter Beinart's articles, one gets the impression that he has been steadily increasing his accusations and incrimination that Israel is more willing to actually harm the American Jewish community (and Mike Davis has been doing that in Great Britain) to protect its policies, especially the presence of Jews who wish to reside in portions of the historic Jewish homeland that were assigned for the future Jewish state but due to pre-1948 Arab terror were intended to be partitioned away. As I have been in favor of shorter posts, let me now get to my point: what were those American Jewish leaders* thinking and intending when they declined to participate in a Washington Chanukah party at the Trump Hotel sponsored by the Conference of Presidents of Jewish Organizations and Azerbaizhan, just recently visited by PM Netanyahu? Were they not sending to exact opposite message: 'we will harm Israel's interests, at the least, to protect our image as liberals'? And as my friend Jonathan Tobin pointed out, they're harming Israel's interests with a Muslim country. And this take. So, who is anti-Israel now? There was a demo with protestors. 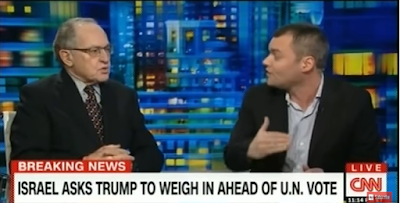 And this Jewish Trump opponent got fired. As Haaretz reports, the Anti-Defamation league, the American Jewish Committee, Hadassah, and the Jewish Federations of North America are also staying away. Do we all remember the song "America the Beautiful", words by Katharine Lee Bates? America! America! God mend thine every flaw......America! America! God shed his grace on thee Till selfish gain no longer stain The banner of the free!......America! America! God shed his grace on thee Till nobler men keep once again Thy whiter jubilee! Delegations headed by Palestine Liberation Organization (PLO) Executive Committee Secretary General Saeb Erakat and Principal Deputy Assistant Secretary of State for Near Eastern Affairs Stuart E. Jones met today in Washington for the U.S.-Palestinian Political Dialogue. The Dialogue offered an opportunity for the Delegations to discuss a range of issues of concern at a senior level, including regional matters. Both delegations strongly condemned terrorism and its supporters in the region and worldwide. The delegations agreed on the threat presented by ISIL, sharing the deep concern that ISIL has dramatically undermined regional stability, particularly in Iraq and Syria, and continues to commit gross, systemic abuses of human rights and violations of international humanitarian law. There is a stain in those words of summation. The Palestinian Authority supports terrorism through its payments to terrorists and its incitement campaign and its glorification actions. The Palestinian Authority abuses human rights, of its own residents as well as Israelis and violates international law. The Palestinian Authority violates its own civil society through embezzlement, oppression, lack of freedoms and not governmental transparency.